FOIA Request Reveals Federal Fraud Investigators Were Stunned To Learn Of Matt Whitaker's Ascent At DOJ - Joe.My.God. As Federal Trade Commission lawyers investigated a Miami company accused of defrauding thousands of customers, they were stunned to learn last year about a new job for a figure in their inquiry, Matthew G. Whitaker: He had been named chief of staff to Attorney General Jeff Sessions. 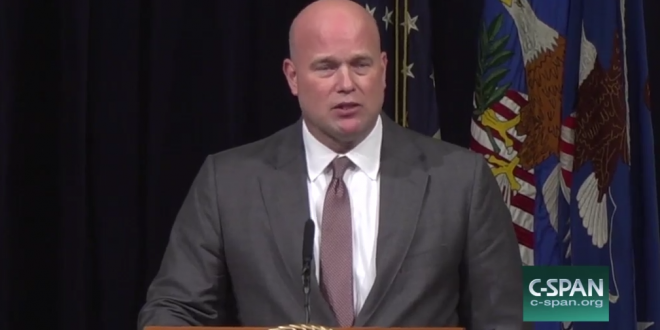 “You’re not going to believe this… Matt Whitaker is now chief of staff to the Attorney General. Of the United States,” James Evans, an F.T.C. lawyer, wrote to colleagues in an email on Oct. 24, 2017. The emails were part of a trove of files the trade commission made public on Friday in response to Freedom of Information Act requests for documents about its investigation into the company, World Patent Marketing. Mr. Whitaker sat on its advisory board. Long before most Americans had heard of Mr. Whitaker, the Federal Trade Commission had been scrutinizing his connections to World Patent Marketing. The company had promised investors lucrative patent agreements but instead brazenly ripped them off, according to the agency. Its investigation prompted a federal judge to shut down the firm in March 2017, and it was later fined nearly $26 million. Good grief. Read the rest.